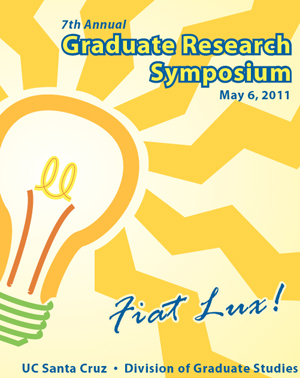 The University Center at UC Santa Cruz will come alive on Friday, May 6, with poster, oral, or multimedia presentations that will be featured at this year's Graduate Research Symposium. The event takes place from 1:30 to 4:30 p.m. In its seventh year, the symposium is designed to recognize and promote the outstanding and diverse research being carried out by graduate students from all disciplines on campus. It is also an opportunity for graduate students to gather as part of the larger UCSC graduate community and to become better acquainted with the scope of research campuswide. "Our graduate students are already beginning their careers as cutting-edge researchers," said Tyrus Miller, vice provost and dean of graduate studies. "The symposium will give attendees a sneak preview of the groundbreaking UCSC graduate work that will soon be making an impact in the realms of creative, technical, and commercial innovation." A panel of judges will determine recipients of a number of best-of-symposium awards; UCSC Chancellor George Blumenthal and Miller will present cash prizes at the conclusion of this year's event.